Mirko Gorelli returns with more Tech House flavours in the form of the two tracker ‘Travel’. 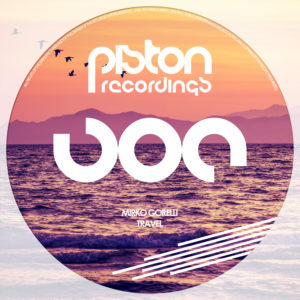 Great to see another fine slice from this guy and after his last Piston release – ‘Black Dolly’ – we’re sure you will not be disappointed with this latest effort. First up we have the solid Tech groover ‘Travel’ which intros with a monster kick drum that will certainly give the bins a rattling. Crispy hi hats are joined by repeating vocals and a probing bassline that sits off the kicks. Subtle pitch changes give the track a real dynamic feel as buzzing synths are introduced alongside subtle arpeggios. The break throws up a sublime sequence that comprises some masterful keys all wrapped up in a mesmerizing package. A truly cosmic experience that is a must have for sure. ‘Work’ intros with a beautifully tweaked kick drum that packs a punch. Sitting alongside the kicks we have shuffling hi hats and percussions that start to weave out intricate patterns creating solid rhythms. A subtle bassline eases its way into the track before coming out the other side with a nice thick probing bass sequence. Cool vocal shots ring out through the track giving off a club appeal that will definitely grab a lot of attention – Top-notch stuff!